Israel’s Prime Minister Benjamin Netanyahu urged the international community not to ease pressure on Iran in order to curb its nuclear program. This comes in contrast with the international welcome to the election of a new president, Hassan Rouhani. “Let us not delude ourselves,” Netanyahu said in a statement on Sunday. “The international community must not become caught up in wishes and be tempted to relax the pressure on Iran to stop its nuclear program. The Prime minister noted that it was Iran’s supreme leader Ayatollah Ali Khamenei and not the president who laid out the policy for the country’s nuclear program. “The more the pressure on Iran increases, the greater the chance of stopping the Iranian nuclear program, which remains the greatest threat to world peace,” he said. 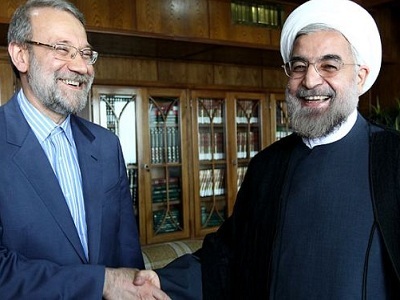 Nevertheless, the international community has welcomed Iran’s future head of state. Washington has already announced its willingness to negotiate with Iran on its nuclear program, even though previously along with Israel, it has refused to rule out military strikes against Iranian nuclear sites. “It is our hope that the Iranian government will heed the will of the Iranian people and make responsible choices that create a better future for all Iranians,” the White House said. Britain and France welcomed the newly elected president in hope of coming to a diplomatic solution concerning the nuclear enrichment program as he is a former chief nuclear negotiator. The EU has imposed restrictions on cooperation with Iran in foreign trade, financial services, energy and other sectors after Iran refused to suspend its enrichment program. The West, Israel and several other countries fear Tehran is expanding its uranium enrichment capabilities with the aim of developing nuclear arms, an accusation Tehran continuously denies. “Iran has an exclusively peaceful nuclear program,” Rouhani said in an interview with the Arabic newspaper Asharq Al- Awsat published on Thursday. Iranian journalist Hamid Reza Emadi told RT that there is hope that the new president might rebuild the Iranian negotiating team to re-open talks with the West. “A lot of people inside and outside Iran believe that tensions will be eased and the situation will be calmer and Iran’s economy will flourish,” he said. As the victory of the moderate cleric was confirmed, crowds gathered on the streets of Tehran celebrating Rouhani’s victory.